Welcome to another issue of Sports Science Monthly. 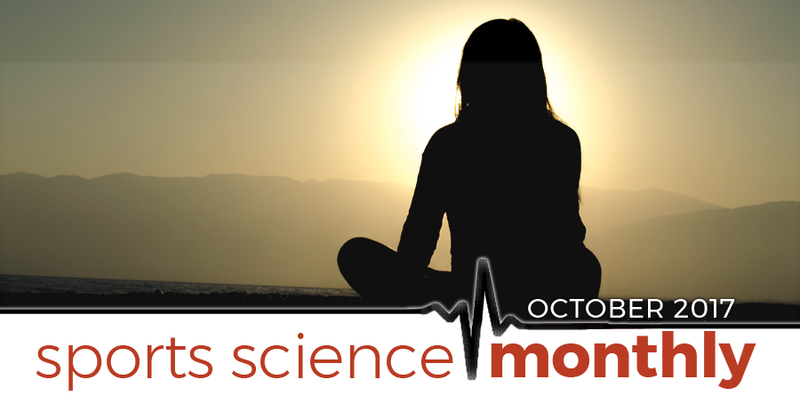 This month, we start with an article looking at a hot topic: mindfulness training. Mindfulness has been a buzzword in daily life, from bio-hacking gurus, and in the realm of sports performance. We’ll take a look to see if the science backs up the claims. We also have a couple of papers looking at injury risk modification; I know this is something I cover often, but getting injured is so often avoidable, and so damaging to athletes in terms of their season and career, and yet it keeps on happening. We then finish with some traditionally boring subjects – internal validity and statistics – where recent research could have huge implications for how you test your athletes and how you interpret the research that aids your decision-making processes. It is crucial that coaches and support staff, and to an extent athletes, become better producers of science (through improved testing and monitoring) and better consumers of science (through improved understanding of statistical methods). I’ll get off my high horse now, and we can kick start this month’s edition. Is mindfulness training in sports all that it is claimed to be? » Quick Summary: Despite getting a lot of media and popular attention in the social media sphere, there is not extensive research on the use of mindfulness training in sport. However a recent meta-analysis found that the limited research on mindfulness training in sport does show a positive effect on sports performance , although this was only tested in a limited number of sports. Mindfulness, and mindfulness-based training, is very much a hot topic right now. If you walk into a book store and browse, you’ll notice a wide range of titles related to the pursuit and cultivation of mindfulness. There are a number of apps, most famously Headspace, which you can use to create daily mindful practices. Many of the popular lifestyle gurus like Tim Ferriss promote forms of mindful practice. Of course, this then crosses over into sport, and we now read about athletes who have made mindfulness training a part of their daily routine and seen their performances flourish. In theory, this is good; the mind plays a huge role in a number of facets of performance, and so being better at modulating emotions should only enhance performance. But given how mainstream it has become, there is often a lot of bad science surrounding mindfulness training and sport. All of which means it’s high time to see what the science says. Fortunately a recent meta-analysis has examined the effects of mindfulness practice on a number of parameters and performance outcomes in sport. Let’s take a look. The authors initially identified a huge number of papers – 15,795 – that were potentially relevant to their question. After screening these, and ensuring the papers met their inclusion criteria (control groups, appropriate age of subjects, appropriate population of subjects, etc. ), they were left with nine intervention trials. This is an excellent example of how quite a lot of the underpinning or at least often-quoted research supporting the use of mindfulness training in sports might not be of the highest quality; if there is no control group, how do you know if the effects are true? In addition, if the research was conducted in 80-year old non-athletes, how do you know if the effects carry over into younger, competitive athletes? That’s why this screening process, carried out by the authors of this meta-analysis, is so important. From these nine studies, there was a pool of 290 subjects who were both healthy and active, and of the appropriate age range. These subjects came from a wide range of sports, including cycling, hammer throwing, shooting, and judo. None of the trials were blinded, which would often be a limitation, but of course, you can’t really give a placebo mindfulness training session. As would probably come as no surprise, mindfulness training was effective at improving mindfulness in these subjects. In terms of the effect of mindfulness training on physiological performance surrogates (such as lower cortisol levels), again there were large effects found in favor of mindfulness training vs no mindfulness training. What is crucial to acknowledge within this, however, if the width of the confidence intervals – they were very large, and almost straddled zero (as a quick primer of confidence intervals, they represent the interval in which the likely “true” value of a statistic lies. The wider the interval, the less certain the result. If the confidence interval straddles zero, there is a chance that there was actually no effect). This illustrates that the positive effects of mindfulness training are highly variable between trials, and most likely individuals. There were similar findings for psychological surrogates (such as lowered anxiety), with narrower confidence intervals that were further away from zero; i.e. we can be somewhat more confident in these results. Whilst changes in physiological and psychological surrogates are all well and good, all that really matters is the impact on performance outcomes; are you actually better at your sport? This was only tested in three studies, and the sports studied were pistol shooting, rifle shooting, and dart throwing (given the latter case, it appears obviously a loose definition of “sport” was applied!). Again, here there was a large effect, with fairly tight confidence intervals, which weren’t close to zero. However, it is unclear whether mindfulness training directly improves the motor skill and/or psychological pathways, or whether it just reduces the negative effects of increased anxiety on performance. Arguably, if performance improves, this doesn’t really matter. Overall, the key finding from this area was that mindful athletes reported less performance anxiety, and given that performance anxiety can reduce performance – especially in precision sports such as shooting and darts – this is likely what drives the performance enhancing effect. The over-arching conclusion from this meta-analysis is that mindfulness training improves mindfulness, which in turn appears to make athletes less susceptible to performance anxiety, which may improve performance, if performance anxiety is a performance-limiting factor in that athlete. Some athletes don’t appear to suffer from the negative consequences of performance anxiety, so it’s not clear how or even if mindfulness training would enhance their performance. We could extend this logic further; some athletes may actually need an increase in anxiety in order to stimulate their optimal performance; might mindfulness training reduce their ability to do so? We don’t know the answer yet, but it’s worth considering. Clearly, we need more research in this field, and greater subject numbers, before we get concrete answers, but this is nevertheless a promising meta-analysis, especially for athletes in high skill and precision sports, where increased anxiety might negatively affect performance. Those previously discussed caveats considered, there is now decent supporting evidence that this type of training might be useful, although the large confidence intervals suggest that it may be more useful for some than others.